Located in Southern California, Los Angeles is the largest city in the state and has the second largest population of any U.S. city. L.A. proper has a population of 3.87 million but what is often referred to as Los Angeles is actually an aggregation of suburbs, independent communities, and beach towns which cover 469 square miles and have a total population of 17.55 million. Los Angeles is California's largest economic center, a major importer and exporter of international goods, and home to many motion picture, television, and radio studios. Los Angeles was founded on September 4, 1781, and was a diverse cultural melting pot with Americans, Chinese, Mexicans, and Spaniards living side by side. Originally named El Pueblo de Nuestra Senora de los Angeles de Porciuncula, which means "The City of Our Blessed Lady, Queen of the Angels of Porciuncula", it was necessarily abbreviated to Los Angeles, which means "City of Angels", or L.A. for short. It was ceded to the nation and incorporated in 1850. The railroad reached southern California in the latter half of the nineteenth century, and coal mining and the discovery of oil in 1892 contributed to a large boom in population. In the early twentieth century the very young motion picture industry relocated here from New York, as the dry, sunny climate of Los Angeles was optimal for film making. Over time, this burgeoning industry grew into the multi-billion dollar mecca known as Hollywood. 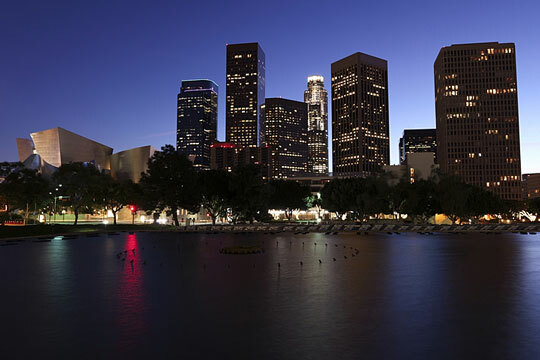 In addition to being an international hub for the film industry, Los Angeles is also home to many museums and cultural events and is a hotbed for live musical performances. Los Angeles City Government - official City of Los Angeles website. Los Angeles County Gov't - official Los Angeles County website. Los Angeles Weather and News - current weather in, and recent news about, Los Angeles. Los Angeles Product and Service Guide - Los Angeles enterprises. Los Angeles Schools - Los Angeles area educational institutions. In-depth Los Angeles information and news can be found on these regional Los Angeles Libraries and Los Angeles Newspapers pages, respectively. Visitors to Los Angeles will find this Los Angeles Tourism and Conventions website useful.